Chandra Sales Chandra Sales, established in 1975, are the dealers for all leading brands in plumbing and Sanitary materials like Parryware, Roca, Grohe, Jaquar, Jal, Nirali, Carysil, Nitco, Asian, Supreme, Halmark, Onida, Lipka, Ashriwad, etc. The business has been spread & managed by the father & son duo of Mr. Suresh Mittal (Managing Partner) and Mr. Parish Mittal (Managing Partner). Inspira : Three shapes, multiple combinations, ample possibilities. This vitreous china and furniture collection, with 3 design lines -Round (round), Soft (with soft angles) and Square (square)-, which can be perfectly combined, will bring life to bathroom spaces in any style. 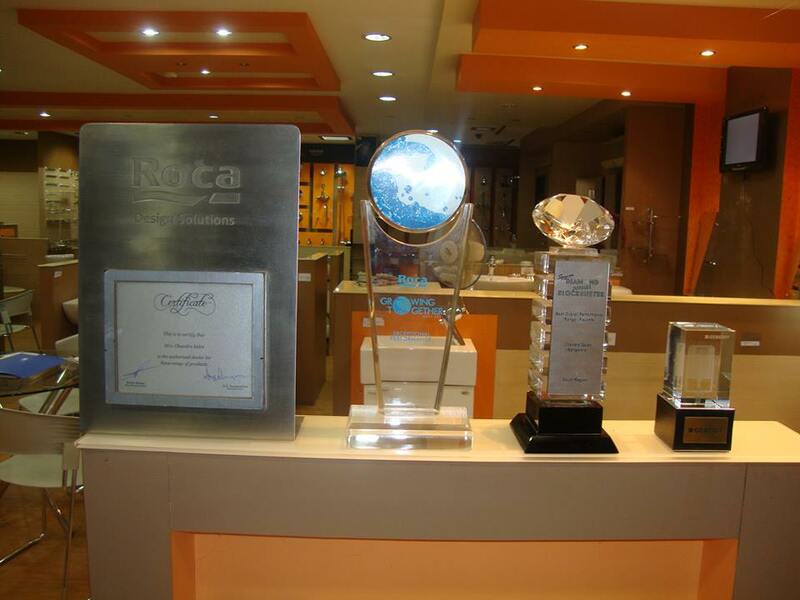 Full Range of ROCA Sanitary Ware on Display at Jayanagar Bangalore Complete range includes Inspira, Dama Senso, Dama-N, Khroma, Gap, Nexo, Giralda, Victoria. Inspira by ROCA Three shapes, multiple combinations, ample possibilities. This vitreous china and furniture collection, with 3 design lines -Round (round), Soft (with soft angles) and Square (square)-, which can be perfectly combined, will bring life to bathroom spaces in any style. Full Range of ROCA Sanitary Ware on Display at Chandra Sales, Basavanagudi, Bangalore Complete range includes Inspira, Dama Senso, Dama-N, Khroma, Gap, Nexo, Giralda, Victoria. The Single Suit collection by ROCA gets bigger and affordable! The new Inspira Commode / Water closet by ROCA. On display at Chandra Sales. Call : 9141568416.